What a perfect family ride! This Ford Certified Escape has plenty of room for trips to grocery stores, and hauling kids around town. Plus, nimble driving performance and high fuel economy is sure to make you appreciate this Escape even more. The exterior of this Escape is modern and the interior is spacious and comfortable. 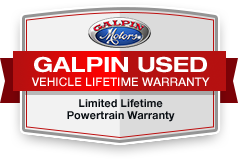 Call us today to schedule your personalized test drive and experience 'Galpin Used Car Difference'.